SPARKS, Nev., – April 25, 2013 – Sierra Nevada Corporation’s (SNC) Space Systems has successfully completed two milestones as part of NASA’s Commercial Crew Integrated Capability (CCiCap) phase of the agency’s Commercial Crew Program. SNC completed the Program Implementation Review, providing NASA with detailed plans for advancing the Dream Chaser® crew transportation system towards a critical design state. SNC also completed an Integrated System Baseline Review that communicated the post-Preliminary Design Review maturity of the baseline Dream Chaser® orbital crew vehicle, mission systems, ground systems, and United Launch Alliance’s Atlas V launch vehicle. SNC was awarded $212.5 million by NASA in August 2012 and to date has received over $330 million by NASA’s Commercial Crew Program. The funding represents the agency’s co-investment in furthering the development of the Dream Chaser® Space System design to carry crew and critical cargo to and from the International Space Station. 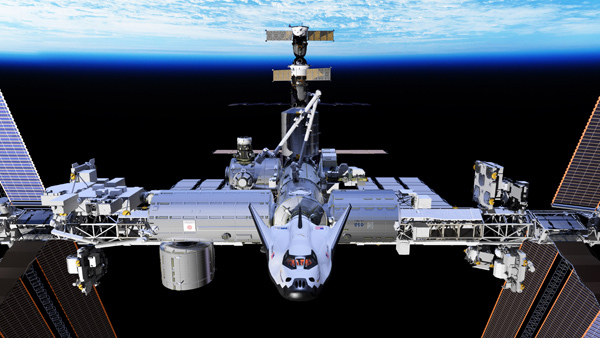 The Dream Chaser orbital crew vehicle is scheduled to complete its first free flight test in conjunction with NASA’s Dryden Flight Research Center at Edwards Air Force Base in Calif., in 2013. Today we are standing at the edge of the greatest adventure in the history of our species, humanity's permanent expansion into space and the birth of a second of human civilization, on Mars. Innerspace.net is focused on delivering news of the new frontier and highlighting the companies, people, organizations and products which are making it happen. © 2019 Innerspace.net. WordPress Theme by Solostream.